Cute With Chris, a three-minute vlog, is written and hosted by Chris Leavins. It helps homeless pets get adopted by making the message completely engaging. Cute With Chris is the latest in the red hot category of cute pet sites that feature user-submitted pictures of animals. Three Minds calls Cute With Chris a video version of Cute Overload, but it’s much edgier and funnier. Beyond cute pictures and a magnet for advertising, Cute With Chris exists to help the animals it features. 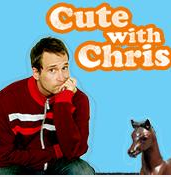 Chris has a great MySpace page, a blog and a talking horse. Watch for stellar ad revenues.